Projects often fail not for lack of visibility. This is just a symptom of why the project didn’t meet the expected result. Often, a project fails because, simply put, the project manager doesn’t have clear insight on how to manage a project team effectively. In this article, we identify seven good practices that any project leader should make, whatever methodology is used. 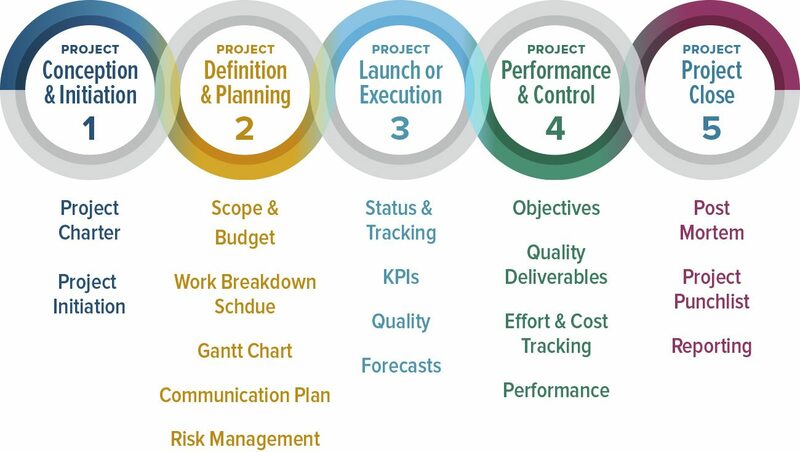 These practices follow the project management stages according to the Project Management Institute’s PMBOK (Project Management Body of Knowledge). It also addresses the common reasons why projects fail, among others: poor communication, lack of visibility and wrong priorities. The first step in our list of good practices or in any project whatever methodology you use is to have a clear picture of what the project is. This sounds simplistic but we all know the devil is in the details. That’s why it’s important to know these details before you start the project. How do you define a project scope? The following should be clear to all stakeholders: you, your team, partners, client, investors and anyone with vested interest in the project. Project goal. The ultimate outcome the project tries to achieve. Example, launch a ride-sharing app. Project objectives. The measurable steps needed to achieve the goal. Example, one objective will be to form a team of programmers with excellent skills in mapping, geolocation, push notifications and payment systems. Project stages. A clear line between the project phases we mentioned above. For example, when do you say the project and your activities have crossed over from Planning to Execution? Budget. How much the entire project cost with details on capex and opex. Resources. The manpower, equipment and other supplies needed. Schedule. A big-picture timeline of the project phases. At this stage it is enough to map the target dates for each major milestone. With a clear picture of the elements above you are now able to define the project scope. Never leave this stage without addressing all of the items above; your project will be more prone to fail or chug slowly along without a clear path or with a missing wheel. It’s not enough to have a clear picture of the project. Everyone on board should agree to its scope. These include the resources, funding, expectations, methodologies and deliverables. Start from top to bottom. A logical way to get the nods of all stakeholders is to start with the players that pull the strings and work your way down. For example, getting the approval of the investors and funders first before setting up a team. You may already define your core team but the adjunct members will have to wait based on the funding you’ll get. To each his or her deliverable. It’s important to be clear of each stakeholder’s deliverables here. You need to specify the role and responsibility of each member to manage their expectations. The more detailed your explanation, the more transparent the work relationship and the smoother the project will flow. Document the ayes. This will protect you and set the agreements in stone should a dispute arise in the future. A project is better managed when you can see the parts that comprise the whole. When you deliver the parts on schedule, the whole falls into place. Or when bottlenecks happen, often, they can be resolved by changing a few parts without compromising the others. Task-based. A verb-oriented WBS that uses a specific action to define the deliverable. For example, design the UI, form the core team or get second-round funding. This type is preferred in a fast-paced project environment, emphasising the need to act now. Commodified products and short-term projects often fall under this type. Product-based. A noun-based WBS defined by the part of the product. For example, UI module, core team or second-round funding. This is preferred when you want to put more emphasis on product quality over speed. Novel and innovative products usually fall under this type. Time-based. It focuses on the project phases as the parts. For example, the project is measured monthly, quarterly and yearly. Time-based WBS is ideal for long-term projects to help you keep focus. Once you have the project scope, everyone on board and the details identified, it’s time to map the critical path. This is the sequence of activities you need to perform over a defined period of time, in short: scheduling the tasks and deliverables. A good practice on how to manage a project team effectively is to use a visual timeline. It shows in concrete form the steps and tasks in a chronological order and plotted against their deadlines. It shows the past, present and future actions to complete the project. Gantt chart. The most widely used type showing a horizontal line that maps the time periods. Events, actions and tasks are plotted against this line, in a way that’s easy to see which ones are in the past, present or future. Dependent tasks are linked to each other that makes it easy for you to see the sequence of accomplishing tasks. Chronological order. A simple presentation of the time periods on a horizontal line depicting the project milestones. In a way, it’s one part of the Gantt chart used mainly for simple and straightforward projects. Kanban. Uses movable cards on boards to organize the tasks from left to right with the former as the starting point and the latter the endpoint. The boards can be moved across the timeline where necessary to adjust to changes. Kanban is a popular agile tool that helps project leaders adapt to unexpected events during project development. Wrike. A popular project management solution renowned for its 3-pane view for clear visibility throughout the project’s lifecycle. Its UI showcases at once the task hierarchy grouped into folders and the project details. Likewise, you get real-time updates on the team’s activities via the newsfeed, where you can also communicate directly to individual members by using @mention. Wrike has excellent analytics that lets you measure project progress, outputs and pacing of each member. It fits small business and enterprise projects. You can sign up for Wrike free trial here. Ideal for: scaling projects. Monday.com. One of the more popular management tools and formerly dapulse, it is a highly collaborative platform tailored to your required workflows. Tasks and projects are grouped into “pulses” or specific rows, each one can be defined with specific scope and dependency. This allows you to contain issues within the sub-projects (represented by a row), for example, while the other rows move on to their original deadlines. Monday.com works best for both agile projects and traditional projects. You can sign up for Monday.com free trial here. Ideal for: agile projects. Trello. One of the popular examples of project management software that focuses on kanban, it uses boards, lists and cards to present tasks, activities and project details. The board contains one project, the lists specify the stages (typically To-Do/Doing/Done), while the cards represent individual tasks and elements. It lets you move the cards from one list to the next (stages), add notes to it, attach files and share them. Ideal for: kanban projects. Codegiant. An agile project management platform, Codegiant provides you with end-to-end project management functionalities. This solution provides users with the choice of going with either focused work boards or a Kanban work board for dealing with development issues. All tasks are displayed in a singular, clutter-free interface, allowing you to easily stay on top of all projects. Codegiant is quite affordable for medium to large groups, while those with a small team of five can use this solution for free. An effective way to keep to your long-term deadline is to make sure daily targets are met. Daily targets roll over into weekly targets, which roll over into monthly goals and so forth. Likewise, when you track daily targets it is easy to spot delays and act on them before they escalate into major setbacks. Update the timeline daily to reflect current progress. If delays happen in a day, plot a critical path that speed up the affected tasks and bring you back to the original timeline. Monitor your resources, making sure you have enough budget, manpower and time to continue with the tasks. Anticipate potential troubles. Have a ready plan for possible scenarios that may delay the project. For example, a key team member gets sick or a client takes time to send feedback. Keep the communication open for feedback. This will help you identify potential troubles like declining team morale or poor workmanship. A lot of things can happen during project development. Stakeholders, especially, those who pull the strings, may change their plan or modify the requirements. The competition comes up with a better project. Or the industry itself develops a new technology that renders your project obsolete. In such instances, you need to manage changes and risks. To minimize the impact of disruptions and help you prepare for sudden changes,do a risk assessment of possible scenarios and assign each a value. For example, you can grade a risk as: 1 = low; 2 = possible but not likely; 3 = likely. This way you can prepare for a response long before the risk is realized. Learn to isolate, apply blockers. Some risks or changes may not affect the entire project, but only parts of it. You must be able to identify quickly what parts have to be isolated so the rest of the project team can continue with the original timeline. Manage resources. You must have a clear picture of all your resources, who are using these and where to allocate them. This is one purpose of project management software: featuring a resource management module exactly for this need, especially if you’re an enterprise with shared resources. Be agile. Agile project management is a must-have skill in today’s highly disruptive business environment. In agile you get to develop sub-projects in increments and resolve issues quickly as you finish each increment. Meanwhile, the entire project moves across an overall timeline. Agile lets you adapt to new goals, reallocate resources fast and get feedback at once. It is ideal for risk and change management. Having an exit plan doesn’t mean you expect the project to fail. Rather, you accept the truth that projects do fail and that all stakeholders must understand their accountability in such case. A project is an agreement among different parties, so when it fails, everyone should be on the same page why it happens. This is not only being professional, but being accountable and transparent. Likewise, this avoids legal disputes, blame game, professional relationships being compromised and even provides an opportunity to analyze the problems for future projects. Define success metrics. These should be measurable and clear to everyone. Success isn’t always about revenues, so make sure your metrics are in place to benchmark your project’s outcome. A clear endpoint. Define the exact stage when you consider the project a fail. This helps you to save whatever budget is left. Many projects drag on for so long bleeding more money when they should’ve been stopped earlier. Capture good vs bad points. In effect, create a case study of the project’s wins and losses, best practices and missed opportunities. The case study is a valuable reference and as precedent to future projects. Whatever methodology you use or project size you handle, these seven best practices on how to manage a project team effectively will ensure a better chance of success to your team.